. 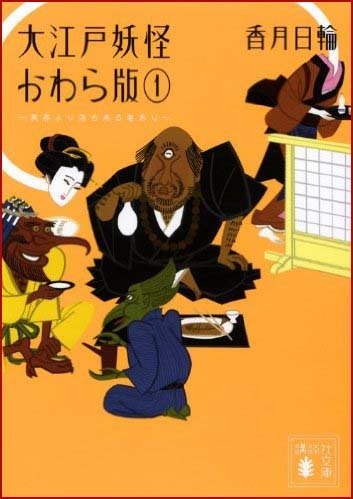 yōkai 妖怪 Yokai monsters and ghosts - ABC-List .
. 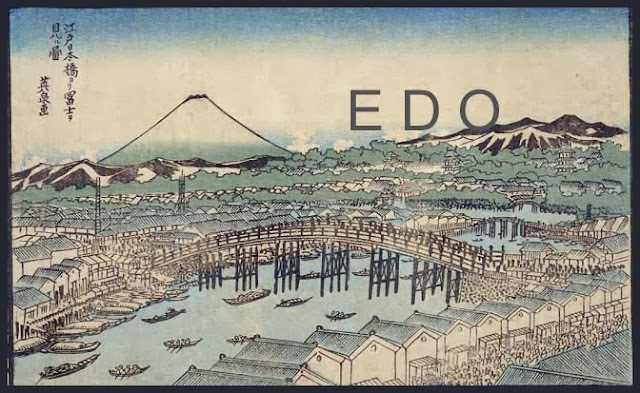 Legends and Tales from Edo 江戸の伝説 . The number seven itself carries a mystical significance.
. Honjo Nana Fushigi 本所七不思議 The Seven Wonders of Honjo .
. Ghosts (yookai, yuurei, bakemono 化け物　o-bake お化け) .
. 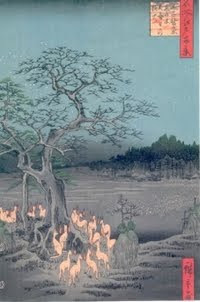 The 53 stations of the Tokaido Road 東海道五十三次 .
. Kaido Ancient Roads - Yokai and Yurei 街道の妖怪 - 幽霊 . In the year 1854 in the 6th lunar month there was constantly ashes raining down to the ground of the Tenjin Shrine in 麹町 Kojimachi. 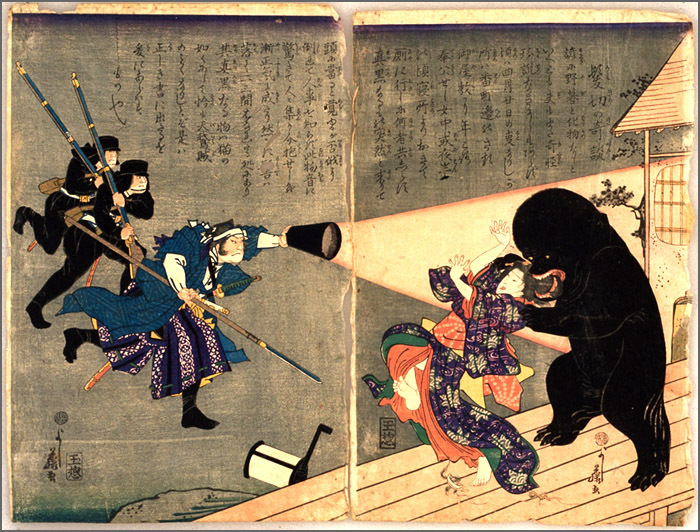 People thought it was the malicious deed of a Tanuki badger. Showed up first in Kumamoto, running busily around the streets, knocking things over. Very similar to the tenjoname 天井嘗 ceiling licker.
. Kappabashi かっぱばし/ かっぱ河 / 合羽橋 in Asakusa . Where the famous water goblin, Kappa　河童, is living. 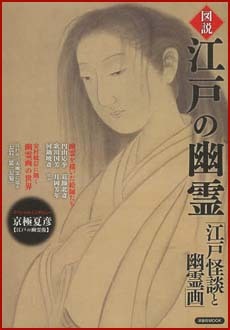 and the legend of Kappa Kawataro 合羽川太郎（合羽屋喜八 Kappaya Kihachi). 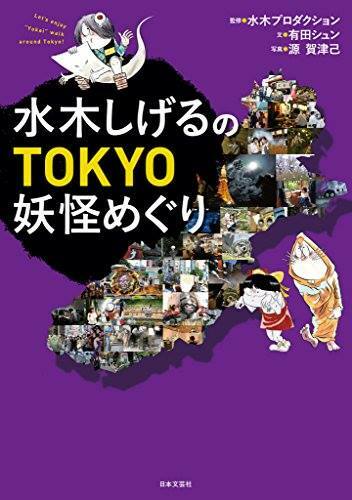 An old fox who lived in the vicinity of Kioi village began to imitate the sound of the train toward Akasaka all night long : gatagoto chinchin ガタゴトチンチン. But there is no train to be seen.
. Kioichoo 紀尾井町 Kioicho district, Chiyoda, Tokyo .
. Konoha Tengu 木葉天狗 / 木の葉天狗 "Tree Leaf Tengu" . One of them lives at Mount Takao, 高尾山薬王院 Mount Takaozan, Temple Yakuo-In, Tokyo. She likes the number three, so she likes to come here. Someone saw her on the road in 千代田区 Chiyoda ward. If there are three people walking together, she comes after them with a knife. In the middle of the night a black monster comes out and cuts the hair of people. Its hands are said to look like scissors, sometimes his mouth also. 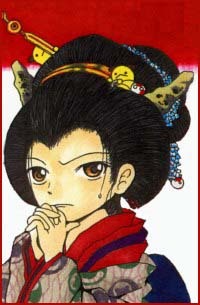 is one of the most grotesque and disturbing yokai and has a hair obsession. Kurokamikiri is vaguely humanoid. It has a bloated body with chubby arms and legs. It has no neck but a bulbous head. Its skin is deepest black and the only features visible are a wide mouth with a slug like tongue and huge flat teeth, and two tiny, evil yellow eyes spaced far apart on its dark visage. 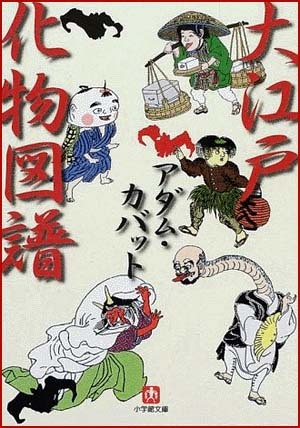 Kurokamikiri will creep up behind its victims and bite off their hair. Kurokamikiri is said to make a “mogaaaaa!”sound. A young girl that would eat anything you put in her mouth. Said to be the yokai of a cat. A monster version of うら若きむすめ urawakaki musume. 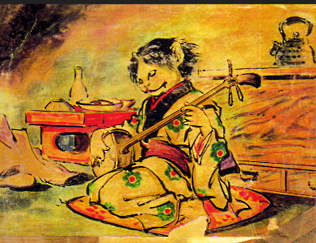 She was often shown in 見世物小屋 curio shows. Once the children of the village were telling stories when in the room next-door there was a strange noise of something falling down. When they looked, it was a huge, huge rice cake and they all enjoyed to eat it together. "Let's hope another one will fall down!" they wondered and indeed, there was again a noise in the room next-door. "Where is that rice cake?" shouted a huge man. They all run away in great fear.
. Sara yashiki　皿屋敷 "the Dish Mansion" .
. sazae-oni　栄螺鬼 / さざえ鬼　haunted turban shell . 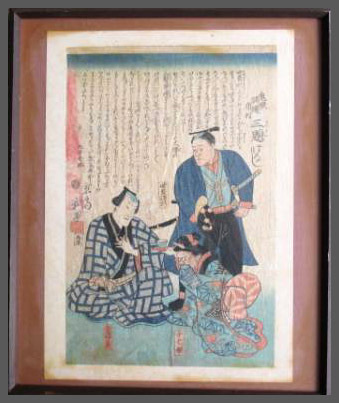 may be found in 品川　Shinagawa.
. Shinozakigitsune, Shinozaki-gitsune　篠崎狐 the Kitsune fox from Shinozaki . A kind of whirlwind (tatsumaki たつまき) that occurs in Saitama. 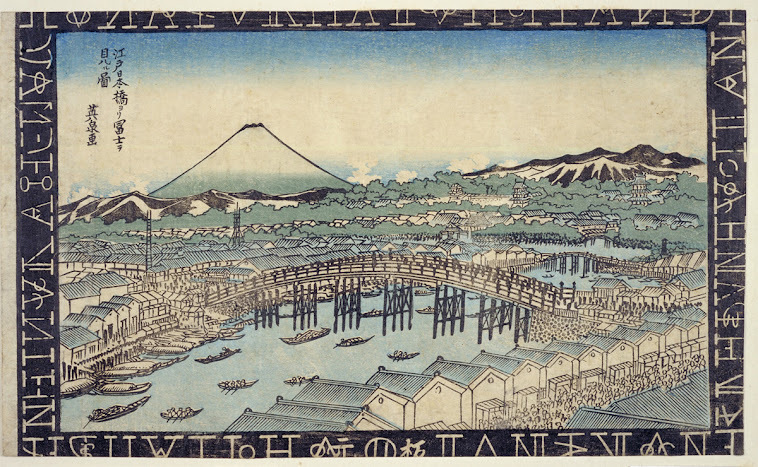 Also called kawa no tachifusagari 川のたちふさがり (you can not cross the river). Sometimes it occurs right in the middle of a river and people were quite afraid of it. It looked like a fearful monster to the people of old. 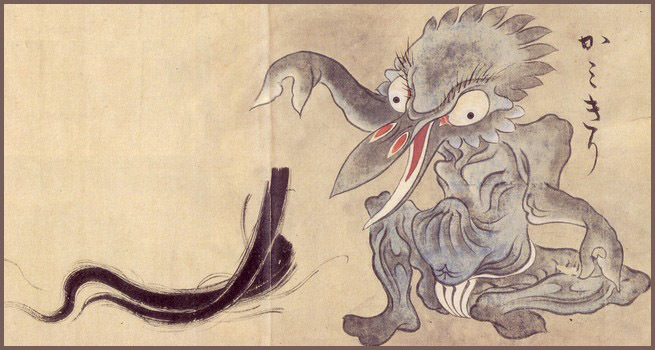 A yokai that appears if a bathtub is not kept clean. He licks grime in the bathroom. 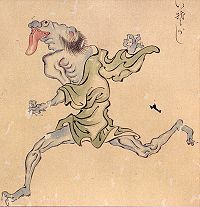 Yokai which rides piggyback on a human victim and becomes unbearably heavy. (or Azukitogi) – A spirit that washes azuki beans. A giant monster appearing on the surface of the sea. A yokai with an old man’s body who cries like a baby. If someone who hears a baby wailing and picks up this creature (which looks like a baby), it becomes heavier and heavier, turning into a rock that crushes the victim. Yokai with a kind-hearted personality who runs the Yokai Apartment business. There are tubes inside her nails that inject sand, blinding people.